A young sailor (Bill Williams) on leave meets a young woman (Lola Lane) and goes back to her flat, after a few drinks he cannot remember what happened but wakes up with a wad on money in his pocket. He goes back to the flat and finds her dead. He leaves and goes to a dance hall where he meets a dancer (Susan Hayward) and she agrees to help him find out who the murderer is and they are then helped by a taxi driver (Paul Lucas). 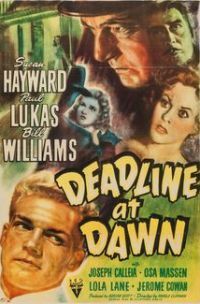 This is a good piece of film noir, with lenty of minor characters and a nice twist in the plot plus an understated performance from an elegant Susan Hayward.